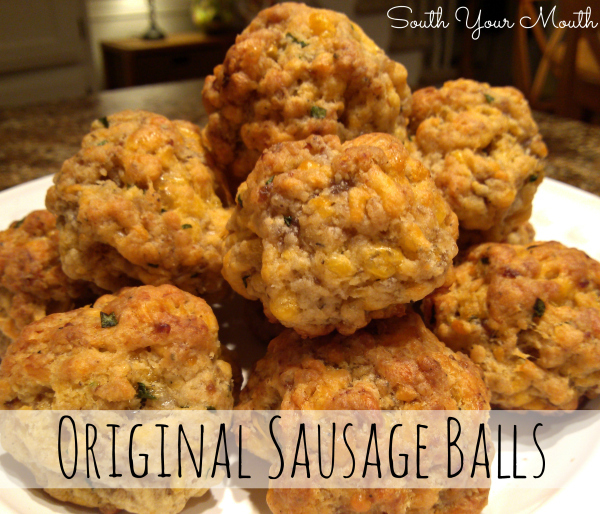 The original recipe for sausage balls using Bisquick, cheddar cheese and sausage. Well, I never thought I’d see the day I’d post a recipe as simple as this to the blog. Because, who don’t know how to make sausage balls? Right? Right?! I mean, I knew what went into them but I didn't know how much because I’d never made them. Bisquick, cheddar cheese and sausage. Right. Got it. But how much of each? So, when Husband told me he wanted sausage balls Christmas Eve, I thought, Roger that! That’s a big no-brainer, good buddy! 10-4, boss, I’m on it! And I picked up the ingredients at the store. But when I went to put them together it occurred to me I didn't know how much cheese or Bisquick so I hopped online to find the recipe. Nope. There’s like 40-gozillion recipes out there for flippin sausage balls. Some with milk, some with cream cheese, some with parmesan, some with herbs and spices, some with eggs, some with caviar. Just kidding about that last one. Wanted to see if you were still paying attention. It took me like twenty minutes to find what I thought was The Recipe. Or at least the one I’ve seen my people make. So, I thought I’d post it here so I can find it again easily and in case you ever find yourself in the same boat and just want to make some dang sausage balls! Combine all ingredients in a stand mixer and mix at low speed using the paddle attachment (or mix by hand) until all ingredients are evenly combined. Roll dough into 1 1/2 inch balls and place on a baking sheet one inch apart. I used my handy-dandy cookie scoop to make quick work out of portioning these. Bake at 350 degrees for 20-25 minutes or until lightly browned on the bottom. I ALWAYS use Jimmy Dean sausage in these. Definitely shred your own cheese. If you find that your sausage balls are too dry with 3 cups of Bisquick it might be because you're using preshredded cheese. Preshredded cheese is coated with cellulose which is a moisture-blocking agent. I used hot sausage with these and I thought they were perfect (and definitely not too hot for the little people). Cheddar cheese just goes so well with a touch of heat. If you use regular or mild sausage, consider adding a little cayenne pepper! Add 8oz. of cream cheese makes them moist and yummy. Add 1/2 package of Phili Cream Cheese to each batch and they will be moist and delish ! LOL, well, seeing how this was the first time I've ever made these I don't really know how to help you troubleshoot them! Maybe make sure you're not cooking them too long? Shonda, try 2 cups bisquick, 1 16oz bag of extra sharp cheese-smaller shredded, 1 roll of hot jimmie deans sausage. If your balls are too hard they may be too small. Try making them round like a ping pong ball or golf ball. 15-20 minutes @ 425, center rack on a cookie sheet, maybe with Pam. Check them @ 10min in and see if they are sizzling..they should be. HEY MANDY! MISS YOU!! If they're too dry when mixing, we always add a few TBSP of milk. Your oven might be set too high..I would try closer to 400 degrees...and check them after 15 to 20 minutes. I use 2 cups of bisquick,probably a 2 1/2 cups cheese, and I put a splash of milk. Cook at 350 for about 20 min. I’ve learned a few tricks here lately with making these. Mine were also turning out too dry so I started asking around. I was told to use 2 cups of Bisquick instead of 3. Try using the 8oz block of the Cracker Barrel Extra Sharp Cheddar instead of the bag cheese and shred it yourself. The bag cheese is too dry and the block cheese contains more moisture. If you prefer 16oz instead of 8 just buy and shred an additional block. I used 8oz and they turned out just fine. It works best if the sausage and cheese is at room temperature…especially the sausage. If you’re in a hurry, throw the sausage in the microware for 30 seconds. Presto! Perfect! The kneading process took a lot less time! I usually cook them at 350 degrees on the middle rack for 15 with a gas range but they seemed to be getting a little more brown on the bottom than I liked so I decided to bump the rack up one notch and that seemed to help. I might even drop down to 325 degrees next time. Use 2 rolls of sausage, 2 cups of bisquik, 2 cups shredded cheese, and 1/4 cup water. Bake at 400 for 20 to 23 minutes. No, they cook in the oven. I add 1/4 cup of evaporated milk and like 1/2 tsp. of vinegar. It works great! They come out nice and moist, just right. You can't taste the vinegar, it's only purpose is to make them moist. I've never thought of adding cream cheese! That sounds good, I think I'll try it. Just so you know, I have never, ever made sausage balls. I've eaten them like there's no tomorrow, but never made them. Maybe I'm just too lazy, but my friends always make them and they all happily send me oodles and oodles of these little balls of yumminess. So I figure, why make them?! Right?!! Please agree with me! LOL!! Have a nice day Mandy! Ha! That's why I'd never made them! Between my Aunt June and my neighbor, Rebecca, they've always got the sausage balls covered! Yes - only use 2 cups Bisquick. They are too dry with 3 cups. I also use 2 cups of Bisquick and agree that 3 cups make them too dry. I used 2 heaping cups of Bisquick and decided to add 8oz of warm cream cheese. Yum! Maybe it has to do with the sausage. I used Bob Evan's 1lb sausage and cooked them twice over the holiday - once with 3 cups and then with 2 cups of Bisquick. The ones with just 2 cups were much more moist and not hard like the ones with 3 cups. I've used the cheaper brands of sausage and used 3 cups of Bisquick( I think the cheaper brands have more fat). When I've used Jimmy Deans or Neeses I've cut it back to 2 cups. Making them with 2cups of Bisquick instead of 3 was a mistake. I tried itand ended up ewit balls of soggy mess sitting in a pan of grease. 3 cups is the way to go. What do you serve them with? A sauce or just plain? (I'm from the North, haven't ever had them!) They look delish! I've seen people serve them with BBQ sauce though I like mine with a little sweet mustard. I'd think any sort of mustard would be great! Frank's Sweet Chili Sauce is good with them too! This is too funny because I HAD to make these today! :D I have a problem getting proper sausage like I'd get it in the US so my batch was really dry too. I had not seen the reviews yet so I improvised and added about an egg & a half, beaten, until I could mold the balls properly. Worked like a charm to bind them together and we've scarfed them up. Thanks! Sometimes, you just HAVE to have them! Glad you figured out a way to make it work! I put 1 egg in mine. 3 cups bisquick , 2 cups sharp cheddar cheese, 1-lb Hot Sausage (Jimmy Dean). 400 degrees for 15-18 min. I have been making these for 40 yrs. Everyone loves them. I thought of egg as well,that's as far as I got.Cheese was probably too cold,hoping these turn out. Taking them to a gathering n haven'tmadethem in 30 yrs or so. Eek! Love these! I've always used 3 c. of Bisquick. It's been awhile since I've had these, so I might have to make them for New Year's. They are delicious with queso (velveeta and rotel). I know, more cheese, but it's the holidays! Right? How much Velveeta do u use? I think Janna means to make a Queso dip to serve with the balls. And she is right, that old standby, Velveeta and Rotel cheese dip, is wonderful with sausage balls! I mean, you just can't have too much cheese, now can you? Take 1 pound of Velveeta, cube it up, throw it in a pot. Add 1 can Rotel chiles and tomatoes. Cook over low heat, stirring, until cheese melts. I sometimes add a teaspoon of cumin and/or a can of Hormel chili without beans. Great for dipping anything, especially sausage balls. I have always used 2 cusp Bisquick and always ONLY Jimmy Dean sausage. I will have to try using a mixer. I always just squish it up with my hands. They get tired and I always have a couple of Tablespoons of Bisquick and cheese in the bottom of the bowl that I just cannot get to mix in well. I don't think I could do it with 3 cups, perhaps the mixer helps. Long time lurker and I just wanted to pop in and say that, and also comment that I enjoy reading your blog - especially since I'm also a Southern girl married to a Canuck! to mx ingredients evenly - place all ingredients in a gallon sized resealable plastic bag and squish together. roll with hands or use cookie scoop to form balls. I always use my Kitchen-Aid stand mixer with the dough hook. I like to use half lb hot sausage and half lb mild sausage, so they have a little kick. 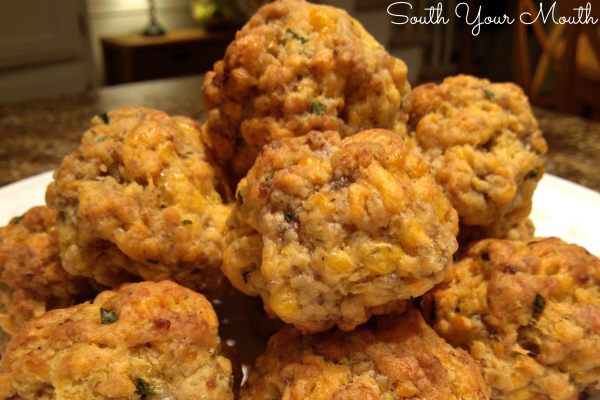 My mom made sausage cheese balls for holiday gatherings my entire childhood...they were definitely a family favorite, but our recipe differs from "the norm" in that she/we only use 1.5 cups Bisquick. We use the same type and amounts of sausage and cheese. We never put any herbs in them, but as I've grown into an adult, I started adding ground sage...because who doesn't love a good sage sausage, right? I'm assuming these are best served warm, but would they also be yummy room temp? I'm thinking of making these for a party that I am invited to, but I'd have to make them at home and take them there. Whatcha think? We've had these during the Holidays for decades, starting with my mother 50 yrs ago. My son is continuing the tradition with his family. We have always enjoyed them fresh fro the oven still warm. When cool place in tin or other covered container, leave on table & munch on them throughout the day. We do LOVE our sausage balls!! I've made these for many years and just made some today. They are not and never will be meatballs; if you want sausage meatballs go look up another recipe. These are classic, a sausage cheese biscuit in a ball shape. They are supposed to be bready. Helpful hints: type or brand of sausage matters! I used Publix (grocery store) generic brand, spicy/hot - no flavor at all. It's what I had on hand but won't do it again. Use good sausage, preferably a little greasy or add a little bacon fat or melted butter.. Sharp cheddar is a must - and do NOT use the bagged grated stuff that contains potato starch & cellulose which affects how it melts and tastes. Cheese you grate yourself from a chunk o cheese will make a big difference in texture and taste. Mine are always smaller than ping pong size. The bigger they are, the more dense they are and just not as good in my opinion. Smaller = cook faster. I cook at 375 for about 13-14 minutes, but it depends on your oven. We like them more orange colored than golden - more flavor. Hope this helps. Forgot to add that sausage should be at room temp, not cold from the fridge. Easy to mix by hand if you don't have a stand mixer with paddle. Forgot to add that sausage should be at room temp = easy mixing. I do it by hand, no mixer on stand. It has to be cheddar cheese?? Pepper jack cheese is the bomb if you like spicy! 2 heaping cups Bisquick the MAGIC happens when I add about 1/2 cup of Mt Olive diced Jalapeños, they are not too hot and the flavor is awesome! My lil family ❤️ these, great make ahead for early morning hunting. Use ground wild hog sausage...let's just say that is as good as it gets(jimmy dean works fine also). Lots of great input about spicing it up a bit I never even thought to try that, didn't think they could get any better. The pepper jack cheese sounds like it's the bomb. I will definitely try that soon. Thanks for the upgrading!! I have been making these for years! A couple of changes I have made along the way...First, I add softened cream cheese to the mix. Second, I melt the shredded cheese in the microwave and then pour it in a large bowl with the Biscuit and room temperature sausage (and cream cheese). Then get your hands dirty and mix it all together; form the balls. The reason I like these so much is because I make these in advance and freeze them. When someone drops by take some out of the freezer and bake for 30 mins. at 350 degrees. Everyone's favorite! About how many sausage balls does this recipe yield? It depends on the size you roll them but when I make them I get about 55-60 balls. Help! I used 2 and 1/4 cups of Bisquick (after reading all of these comments), 1 pound of Jimmy Dean sausage and 16 ounces of cheese that I shredded myself. I rolled them in to 1 - 1 and 1/2 inch balls and put them in to bake. The balls ended up looking like cookies when they were finished. What can I do to have them keep their shape? Did I miss something? Thank you! I really don't know. I've never had that happen. I'd say maybe not enough Bisquick but everyone else seems to have success using less than 3 cups. Was it some gluten or low carb free variety? I make these ever year, they have all came out the first time. I cook my sausage first, then add all the other ingredients . Bake on 350 degrees for just until they turn out brown! Perfect!!! Made them for Christmas but they were eaten before the party!!! Lol there is nothing you can do wrong! Just practice!!! 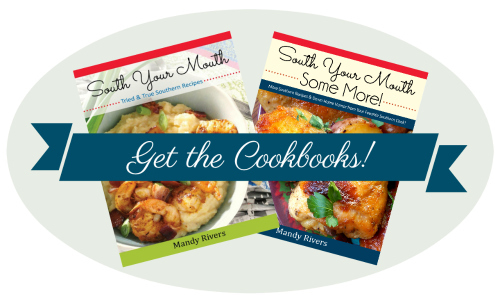 Thanks for all the recipes I know I am going to have fun cooking them!!! Thanks Mandy!!! I just made a batch this morning. I did the 2 cup (slightly heaping) Bisquick, 1 lb. sausage (hot), but, I used a 2-cup (8 oz.) bag of sharp shredded cheese. Baked @ 350 for right at 25 min. Turned out just fine. I did the same thing just before Christmas and got some flat & soft "cookie-like" sausage balls. I think it was the cheap brand of sausage I used (too much fat to meat ratio?) Just thought I'd share that with your viewers. Use the best quality ingredients and all should be OK. ..that and don't over cook! Lori....possibly too much cheese? Next time try cutting back to 8 - 10 oz. of cheese. ( with the same amount of sausage & Bisquick that you had used previously. Ok ... stupid question time. Do you or do you NOT cook the sausage before mixing this altogether? Do not cook it first. One cup of Bisquick can be substituted by a mixture of one cup of flour, 1½ teaspoons of baking powder, ½ teaspoon of salt, and 2 1/2 tablespoons of oil or melted butter (or by cutting in 2 1/2 tbsp Crisco or lard). Use your stand mixer if you have one. I finally started doing that and boy does it make mixing these easier! Much less stuff on the bottom of the bowl. I also use 2 cups Bisquick and only Jimmy Dean sausage. They always come out delicious! Reading all of these comments and I want to chime in on the "3 cups of Bisquick" vs "2 cups of Bisquick." My recipe is so old and it calls for 3 cups, so that is what I've always done and I'm happy with the result. BUT I am one of those cooks who stirs the Bisquick (or flour for other recipes), spoons it lightly into the cup, then levels with with the back of a knife. I'm thinking if you scoop the Bisquick and then shake it off to level it, then your measure and mine are significantly different. One day I'm going to weigh the two measures and see. What do you think? DING! DING! DING! I think you are exactly right!! My scant 3 cups is probably the same as someone else's packed 2 cups. Excellent point! after I bake them, should I transport them to my in-laws in a crock pot to keep them warm or will they get soggy? I think they would get soggy, yes. I line a basket with a clean kitchen towel and wrap them up in that. You can also fill a clean sock with uncooked rice, heat it in the microwave for 3-4 minutes and tuck it in with them. The rice will keep warm for hours. Should these be stored in the fridge after baking/cooling? Was wanting to make these for my nephew. He has food allergies and can't have dairy among other things. He can have sausage and biscuick though. Any thoughts of making them with just sausage and biscuick? I was just gonna leave out the cheese but was afraid they would be dry without it. Add a couple tblspoons of milk. The grease in the sausage also helps them not be dry. Try adding a cup of cooked rice to the original recipe. I've been doing that for years and they come out nice and moist, instead of hard and dry. Just like making meatloaf, meatballs, and hamburgers, don't combine in a mixer. It makes it too dense. Get in there and use your hands with room temp. ingredients. Hey guys, I have been eating these as long as I can remember....but have never made them. I am about to try for the first time but I live at elevation (all the people that made these when I was growing up live back in NC...I'm in Denver now, a bit higher in altitude). Any advice on ingredients and/or cooking time? I'm kind of a baking noob so any advice is welcome! I just stumbled across your blog while looking for some different recipes and have to say...you have made me smile more than once tonight. Love your sense of humor. I read most of the responses here and didn't see one that mentioned these freeze really well. A month or so ahead of the holidays, I like to make a double or triple batch and place them in gallon size zip-loc bags after they cool. So handy to have on hand during the holidays. Just pull out a bag or two to thaw on the counter for a couple of house and pop in the microwave to heat. I have also added a little bit of finely diced onion and bell pepper and that takes them up a notch. I have made these for about 40 years now, and I have always used Owens hot sausage, and 1lb of grated sharp cheddar cheese- not the prepared grated cheese. I've tried 3 cups of Bisquick, but that made them too dry, I use between 1 1/2 to 2 cups of Bisquick. I often add about a tablespoon of garlic powder to mine. Mine never last long enough to freeze. I had a dear friend who is deceased now who made the best ones I've ever eaten, I used the same recipe, but mine never tasted as good as hers,don't know what her trick was, but the were to die for. I'm making these and my delicious cranberry salad for our quilting Christmas party brunch next month. These are good cold,warm or room temp. I live in W.Tex and everyone here seems to love these munchies. Do you cook the sausage before mixing with other ingredients? Could you cook them the night before and heat it up the next day. Has anyone tried making these with the Bisquick Gluten Free mix? My sister has celiac disease so I would have to make them Gluten Free but I think she will love them if it works. Thanks in advance. OK, replying to my own post. I made them using the Gluten Free Bisquick after seeing a couple of versions using that on the web. They taste a bit more "gummy" than the regular Bisquick ones. Next time I make them I will try an alternate recipe I found that doesn't use GF Bisquick but a GF flour mix instead. Happy Holidays, all! This is the perfect original recipe. If it is too dry, add a little melted butter. The only thing I do differently is roll each ball in butter, place and bake. I've been making these for more than 40 years. The "original" recipe I knew was 1-1-1. One lb Jimmy Dean's Hot Sausage, 1 lb grated cheddar cheese and 1 cup Bisquick. Now I see all these recipes calling for more Bisquick and my by-the-book engineer hubby is a follower. They are always too dry so we make a 2nd batch with less 2 cups Bisquick. I still think it was best at 1 cup + 1 pound + 1 pound. The good news is, even the bad ones are good. Great recipe! Made these this morning. I made a half batch since there are only two of us. You must used fresh grated cheese and not the pre shredded. Added in a good sprinkle of garlic powder and several tablespoons of milk for moisture. Used the cookie scoop to make the balls and baked for 20 minutes at 350. Divine! I made mine with the exact measurements listed above and then took some of the hints other people posted and applied them. I didn’t use the parsley or chives. I used great value brand mild sausage and great value brand finely shredded sharp cheddar and I used great value brand bisquick. I was worried about them being dry so I added one egg into my mixture and used a kitchen mixer on lowto get all the ingredients combined. Then when I was forming the balls I dipped my fingers in water to keep them moist and after the balls were formed I melted some butter and let them roll in the butter. I didn’t put all of them in butter because the butter was on my fingers and didn’t wanna overdo it. So use your best judgement. I don’t think lathering them in butter would work so well but kind of gently basting them with it helped. It kept my fingers greased up. So those are what I used. I thought of adding cream cheese but I didn’t. I’m pretty happy with how they turned out. I cooked mine on 350 for 25 minutes. I only use 1 cup of Bisquick and always grate my own cheese (extra sharp cracker barrel) as the pre shredded stuff dries it out. 1 lb of hot Sausage (greasier the better). 375 for about 12 mins, flip and 8-10 on second side. Line a plate with paper towels and let them sit a few mins to drain the grease. They are always delish!! I make these two or three times a year. I never ever use bisquick, my Grandma would slap me if I did. I miss my sausage and cheese together then add flour until I get to the consistency you desire. You don't need cups of it and mine are always moist and juicy. Have you ever made these with sauerkraut? I doubled this recipe - using 4 1/2 to 5 cups of Bisquick and 2# of sharp cheddar cheese which I grated myself. I added 8 ozs. softened cream cheese, garlic and onion powders, freshly ground pepper, 2 large shallots (finely chopped) and fresh parsley (finely chopped). I baked them the full 25 minutes, checking at 10 and 20 minutes, then adding time as necessary. They are light and airy, flavorful and delicious! Thanks for reposting! I was in the same boat as you and glad to find this! And please know that I enjoy many of your recipes! Thanks for all and Merry Christmas! This is the best recipe and how I've made them for decades. However, mix 2 tablespoons of maple syrup into the mixture, then drizzle REAL maple syrup (just a little) as soon as they come out of the oven... magical!!!! I thought I read sonewhere you used Red Lobster Biscuit mix instead of Bisquick. Is that right? I have a recipe that is at least 50 years old. It was always great. I went for a few years without making them and when I finally did they were dry. I think the fat content has changed through the years. My recipe used a jar of cheese Whiz. When I make them next I will try less bisquick and fresh grated cheese and always Jimmy Dean sausage. Just wondering if anyone ever used another biscuit mix, like Jiffy biscuit mix? If so, even exchange with Biscuit? recipe is spot on. the key is to get jimmy dean hot, and have a kitchen aid mixer with cheese grader. using block cheese is the that is finely shredded causes it to mix into the meat so well. If you buy pre shredded cheese the results will be very sub par. I let the kitchen aid mixer with the paddle work on the sausage first. I then add the bisquick, let it mix them together really good. Then add the cheese, and chives. Bake for 20 mins. I made around 36 that are perfection. I am going to attempt to make some with fresh smoked(ground) pork sausage. I think maybe I should use an egg or two because of the lower fat content in the smoked sausage and also baste em with melted butter. What do you think. I read through all of the comments. It's amazing how many different ways there are to make sausage balls. In my opinion, my husband has the best recipe. They always turn out moist and delicious and everyone always asks for the recipe. 1 roll Tennessee Pride sausage (hot or mild- we each have our preference). The key is to shred the cheese and melt in the microwave before mixing with Bisquick and sausage. When you melt the cheese first, you add oil to the mixture. Then they aren't dry. Only one other person commented and said she melted the cheese. We also only use Kraft cheese and Tennesse Pride sausage because both are a little greasier than other brands. I just use my hands to knead it all together (be careful with the hot cheese). Makes 32-36 balls. Cook on 375 for 15 minutes (18 minutes if the balls are frozen). Sprinkle with salt (this really adds to the overall taste). 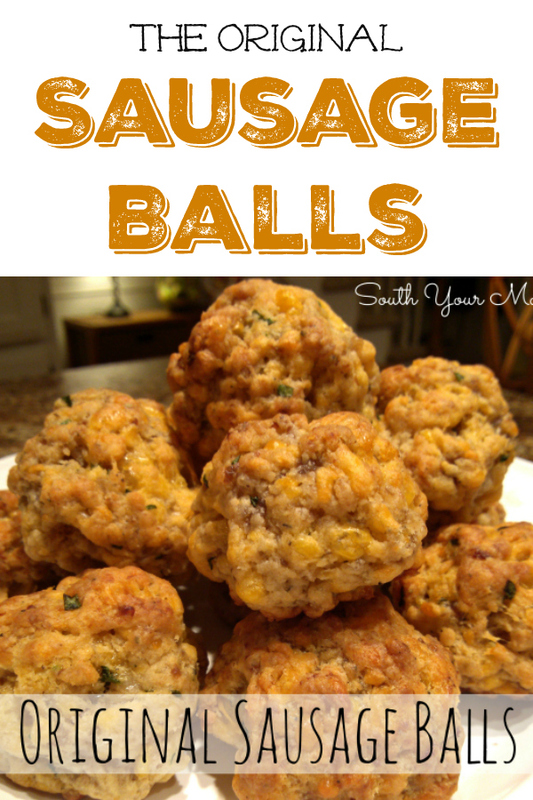 I promise these are the best sausage balls you'll ever make! Well I made sausage balls for my first time. I used 1 lb homemade cajun sausage 3 cups bisquick 1 lb shredded sharp cheddar in bag 2 table spoons worcestershire sauce and 1 cup milk. they came out really moist. very good but i feel i can tweek it and make them better.